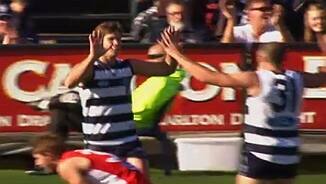 The final siren sounds and Geelong will be playing a home final next week after defeating Sydney by 34 points. The Swans will travel to Adelaide next week to face the Crows. GOAL CATSHawkins gets it over the top and kicks his fourth. He currently leads the race for the Coleman Medal. Two goals ahead of Pavlich. BEHIND CATSHawkins marks on the 50 but his shot misses to the left. 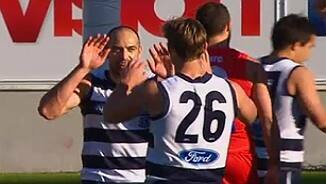 GOAL CATSHawkins knocks it on to Podsiadly and he seals he deal for Geelong. GOAL SWANSJude Bolton flies in the marking contest and takes a good mark. He shoots 25 metres out on a 45 degree angle and has no problem at all. Cats by 21. 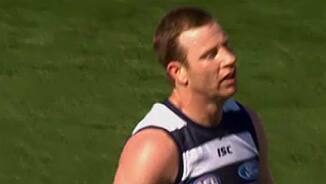 Geelong have made their substitution with Vardy off for Motlop. GOAL SWANSGoodes soccers it to himself then follows up to soccer it through for a goal. The Swans are coming but have they left their run too late? GOAL SWANSSydney works it well from defence to attack with Armstrong's penetrating handball finding McGlynn. 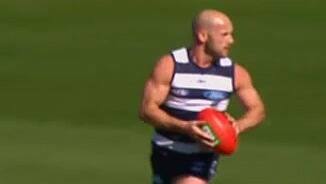 He puts on the burners and kicks a goal from the 50. The Swans will go into a finals campaign losing three of their last four matches. Hardly premiership winning form. GOAL SWANSA free kick and 50 metre penalty takes O'Keefe 35 metres out directly in front. He won't miss this and he doesn't. The goal umpire did not move. GOAL CATSThe crowd are delighted with proceedings as Podsiadly does the regulation two step sideways shot at goal that Geelong players do so well. It's a 44 point margin and this one is sorted. GOAL CATSBartel marks it 40 metres out. he sends it straight through the middle and the Swans are in trouble. They will be playing Adelaide in Adelaide next week with the Cats leading by 38. GOAL CATSIt comes unstuck at the kick in for the Swans and it goes to the worst possible player. Mackie picks up, thanks everyone for coming and slams it through. BEHIND CATSDuncan marks outside 50 but he hooks it going for distance. 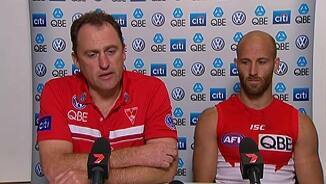 The Swans activated their substitution at three quarter time with Walsh donning the much dreaded red vest. Parker comes on. The final quarter is underway. The third quarter was all Geelong and they are set to host a home final if they can hold on and win here this afternoon. They are nearly there with a 25 point lead. GOAL CATSPodsiadly wrestles the ball and kicks a low and bouncing ball to Hawkins who breaks the tackle and kicks the goal. The Cats are on fire. Call the fire brigade! GOAL CATSChapman runs with the flight of the ball and kicks his third goal. 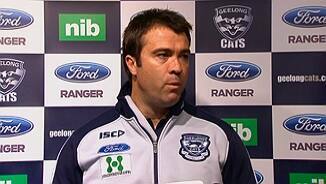 Geelong by 19 points. GOAL CATSChristensen is sandwiched in between two Swans and is taken out of the marking contest illegally. From 20 metres out he guides it through. GOAL CATSFree kick is paid to Geelong deep in attack. Duncan chases the ball down and plays the advantage right under the goal posts. He slams it through. Cats by 6 points. This is one great game of footy. You cannot call the winner of this one from this far out. BEHIND SWANSKennedy turns and tries one but misses to the left. BEHIND CATSChapman tries one from distance, but misses to the left. Cats ahead by that point. GOAL CATSHawkins comes out and takes the mark in trademark style. He is big and he is strong. He is a weapon. He kick from distance and it sails straight through. Scores level. GOAL SWANSJack runs in on the boundary line and kicks a cracking goal to put the Swans back in front. Magnificent kick! BEHIND SWANSBolton marks 40 metres out, but his shot just sneaks in for a behind. GOAL SWANSSydney has started the third quarter on a high as Walsh marks uncontested. He goes back and slots it through. It's a one point ball game folks. It has been a slow start to the third quarter after the frenetic pace played out in the first half with another rushed behind to the Swans. BEHIND SWANSThe scoring gets underway for the half with a rushed behind to the Swans. The third quarter is underway. The siren sounds for halftime with the Cats leading by 9 points. BEHIND CATSBartel's long kick is off hands and through for a rushed behind. BEHIND CATSScarlett desperately punches the ball through for a behind. BEHIND SWANSKennedy marks 40 metres out but his shot misses to the left. GOAL CATSWelcome back Vardy! It's like he hasn't missed a game all season. He rushes out confidently and takes the mark. From 50 he kicks it long and kicks it straight. This match looks set to go down to the wire with neither side giving an inch. GOAL CATSChapman kicks long to Lonergan who is all alone in the goal square. He marks, plays on and kicks the goal. Cats back in front. GOAL CATSHawkins marks. He steps out to the right and the umpire calls play on. He kicks it through the middle regardless and has an animated discussion with the umpire. BEHIND CATSJohnson marks and plays on but misses one he really should have snagged. BEHIND SWANSGoodes' long shot at goal is touched on the line. GOAL SWANSGoodes handballs over the top to McVeigh who is the only player inside 50. His long kick rolls and rolls and rolls and it's a goal to the Swans. The second quarter is underway. The Swans lead by 2 points at quarter time. BEHIND CATSVardy rushes out to take the mark strongly. His kick misses to the right. GOAL SWANSKennedy gathers with his back to goal. He spins around and kicks off one step. Magnificent goal to put the Swans back in front. BEHIND SWANSBird tries to grubber one on the ground but it misses to the left. A potentially massive story on the first week of the finals with Chapman reporting for striking with a forearm to the head. GOAL CATSA clumsy free kick given away by Pyke with the Cats running away. Hawkins marks 15 metres out. He handballs to Johnson who looks up at the crowd before slamming it through. 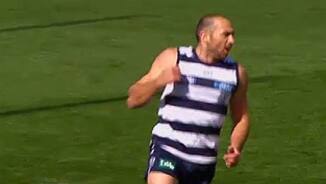 BEHIND SWANSThe Cats are not marking their men and they leave Goodes all alone. He lines it up and misses to the right. BEHIND SWANSWalsh has an opportunity to put the Swans in front and he does. But only by a behind. GOAL CATSThe Swans are under pressure in defence with Pyke turning it over. Enter Mr J-Pod who gathers the ball and snaps it through for a goal. Scores are level in Geelong. GOAL SWANSMumford falls and is pushed with the umpire harsh to pay the free kick. Mumford knows how to play this ground and proves it by kicking the goal. This match is being played in perfect conditions with the sun out and conditions very comfortable. GOAL CATSIt's a hot game of footy here and it is Geelong's turn to get involved. Corey kicks diagonally to find Chapman hugging the ball. Chappy goes back and slams it through. BEHIND SWANSTaylor does the defensive work to punch it through for a behind. BEHIND SWANSCoast to coast with the Swans running it hard. McVeigh attempts to finish it off with a checkside but he misses to the left. BEHIND CATSRepetitive action at both ends with Chapman missing narrowly. GOAL SWANSSwans win the clearance with the handball going to Goodes. He keeps running and checksides it through for a goal. GOAL CATSChapman roves the ball at the contest and snaps it through for a goal. BEHIND CATSBartel marks it inside 50 but the breeze drags it cross the face for a behind. 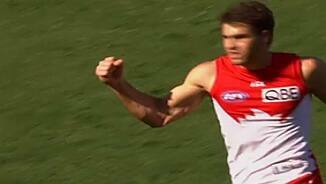 GOAL SWANSJetta kicks long to McVeigh who shields his eyes from the sun to take the mark. He goes back and keeps it low. It's no problem despite the breeze. We are off and underway for the first quarter. Motlop and Parker are the designated substitutes for the respective sides. The Swans make one late change with Armstrong coming in for Smith. Welcome to Simonds Stadium for the highly anticipated clash between Geelong and Sydney.